There are some dishes which you enjoy eating but do not dare to make, one of such dish for me was baati. I have eaten it few times...in a tiny village in Rajasthan, at my neighbours house and most recently in a authentic Rajasthani restaurant in Dubai. Thanks to Arva ( the talented blogger behind I live in a frying pan ) who introduced this restaurant in one of her unique foodie tour. I really liked their daal and kept on boasting about it to my hubby. And from that day onwards, on every weekend he used to propose to go there for dinner, but somehow the visit kept on getting delayed. But finally last weekend we went there and enjoyed the daal, baati and the heavenly choorma.. Choorma was mildly sweet with heavy fragrance of ghee. More ghee to dunk in the baatis. Preheat the oven at 220 Degrees C.
Mix all the above ingredients in a big bowl and using warm water knead into a firm dough. Dunk the baatis in ghee and place them on a baking sheet. Bake them in the preheated oven for 20-25 minutes or till they turn brownish in colour. Now broil them for 3-4 minutes to get even nice dark brown colour. Take the baatis out of the oven. Again dunk them in ghee before serving. Soak all the lentils in water for about 2 hours. Pressure cook them with turmeric powder and little salt for 3-4 whistles. Grind tomatoes, green chillies and ginger together and keep aside. 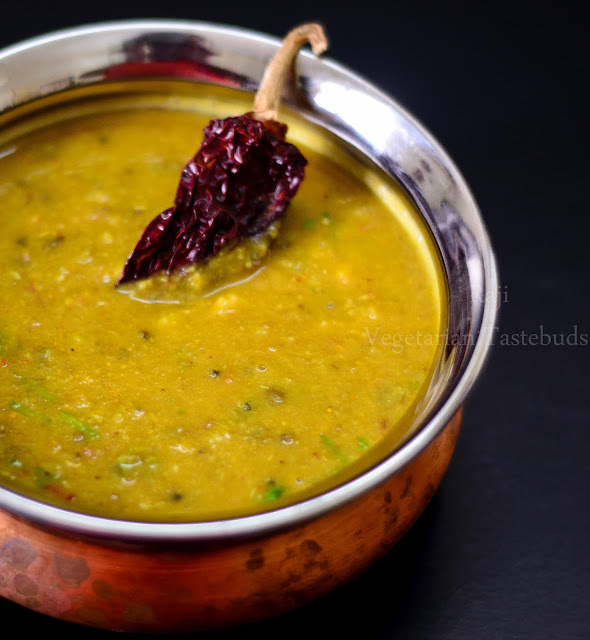 Heat ghee in a deep pan or kadhai, once ghee turns hot add in asafoetida and mustard . Once mustard splutters add in cumin. After cumin crackle add in the tomato paste. Stir to mix. Now add in salt, red chilli powder and coriander powder. Keep on stirring and cooking this mixture, till the raw smell of spices goes away. Now add in the cooked daals and required water and cook in medium flame till the daal starts boiling. Once boil comes simmer the gas and keep on cooking for another 5-7 minutes. To eat daal and baati, take a baati and break it in 4-5 pieces. Dunk them in a bowl of daal, if required a tsp of ghee can be added. 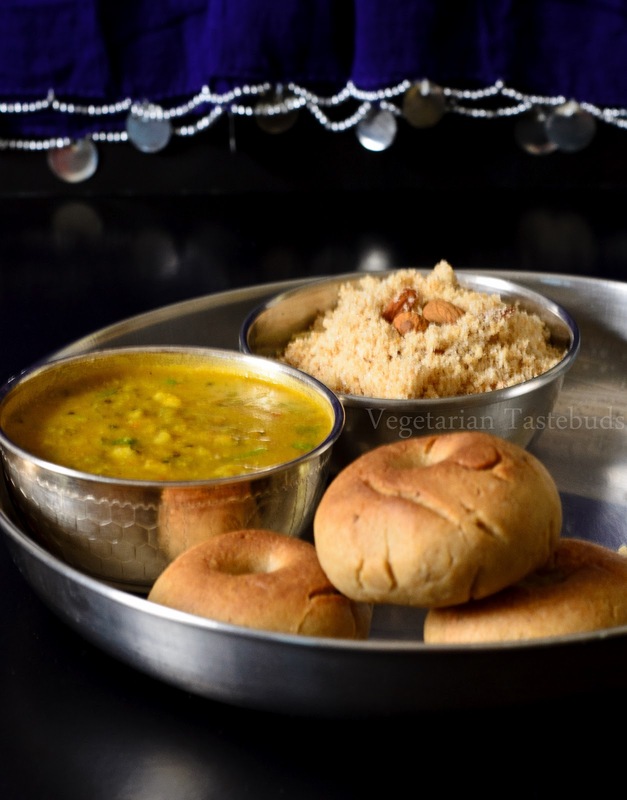 Enjoy the daal baati hot accompanied with the choorma. never tried making this at home. looks perfect. This sounds like a delicious meal. I have to cook more indian food !! You always make me hungry with your delicious recipes. My goodness, this combo looks so inviting. Great photos. I've heard of this so much but yet to taste, both the baatis and the dal look so delicious..
very new to me.. but it looks yummy.. in daal you used all varieties.. nice.. 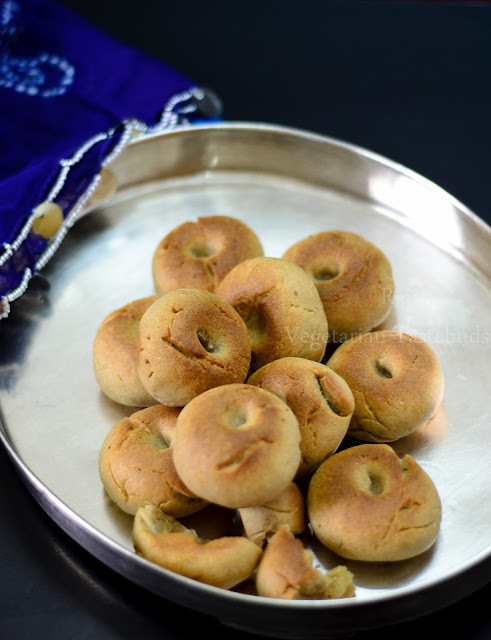 Very yummy looking daal baati, one of my Rajasthani friend makes it and it surely tastes heaven. Looks delicious and tempting. Love the dal without onion and garlic. Nice click. The bread looks so cute and nicely browned, perfect with that yummy daal! what a lovely combo....my mouth is watering looking at the snaps..really wow!! looks super tasty raji! 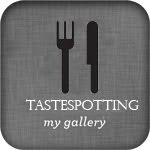 love ur pics!....n tat dal looks very delicious! Though heard about dal bhatti ,never tasted the unique flavor..looks simply superb! wow it looks perfectly made. love the baked batis. Very long back i tasted this in a friend's place. This looks damn tempting and inviting raji!! Heard lot about this combo very much,yet to try it..Very well executed..
Love the combo. Healthy and looks delicious. looks very perfect n tasty. You know what, I never ate daal baati! Now, I am so curious about it. Have to find a restaurant where they serve it :) before i even think of trying my hand on it. u are one courageous lady !!! I could only think of enjoying this specialty when I am eating out. Looks superb !! Love this preparation to the core and your bati looks perfectly baked. The daal looks inviting too. Slowly getting to know each one at FiA... there's quite a lot of solace in your blog - the visuals look organic and fresh, simply but beautifully written. Our best friends are Marwaris and I have been exploring the Vegan world more intensively only for them. And I also wait for all the festivals and pujas that require fasting so that my friend can make daal-churma! Love it Raji...the pics speak volume about the dish. Very nice recipe. I love Baati..the entire plate looks yum!..where is the choorma recipe..will check it out.. Thanks...I am sincerely looking forward to try this out and I am sure it is a great recipe! Thanks heaps. Thanks heaps. I am looking forward to use this recipe and I am sure it is great! Please leave a comment. Your views are much appreciated. Vegetarian Tastebuds by Raji is licensed under a Creative Commons Attribution-NonCommercial-NoDerivs 3.0 Unported License.